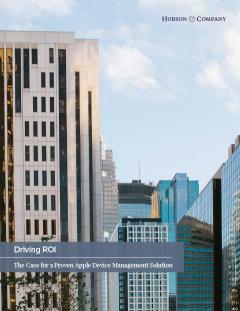 Hobson & Company (H&C), a leading research firm focused on total cost of ownership (TCO) and return on investment (ROI) studies, conducted independent research consisting of 15 in-depth interviews with Jamf customers and found that a proven Apple device management solution delivers a quick and compelling ROI to both large and small enterprises. These stats only scratch the surface of what you get with a purpose-built Apple management solution. Download the full H&C report for a complete analysis of the ROI your organization can expect with Jamf Pro.